Simple example Reaper project with Analyzer and MIDIator. Spectral flux of the input signal will control Reverb Room Size Since we use only one input and it modulates its own reverb, the setup is not crossadaptive, but rather just an adaptive effect. 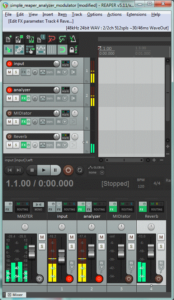 The basic setup can be extended by adding more input channels (and Analyzers) as needed. We do not need to add more MIDIators until we’ve used up all of its modulator channels. enable MIDI out, rather we can select MIDI hardware output in the routing dialog for the MIDIator track. In Reaper, the MIDIator plugin will start processing all by itself (no need to open its editing window to kick it to life). You need to enable a virtual MIDI device for input (remember to also enable input for control messages) and output. This is done in Reaper preferences / Midi hardware setttings. The analyzer does not send audio throu, so we still need to use two input tracks; one for the analyzer and one for the actual audio input for processing. The MIDIator is set up to map the spectral flux of Analyzer channel 1 to Midi controller 11, channel 1. The audio input is sent to a Reverb channel, and we’ve mapped the MIDI controller (11 on channel 1) to the Room size control of the reverb.